This section focusses on the the temporal and spatial correction of magnetic data prior to the interpretation phase. In most cases, these processing steps are completed by the acquisition team, providing both the raw and processed data as a final product. The Geological Survey of Canada geomag page can provide graphs of diurnal variations observed at any of 11 magnetic observatories in Canada, for any day in the most recent 3 years. it is also possible to use inversion at a large scale to define a regional field. Clearly this process involves some degree of subjectivity and will depend upon how you draw a line that separates the desired “signal” from the background. The situation becomes more complicated for magnetic maps (data collected over an area) where the causative bodies have complicated shapes and variable dimensions. Nevertheless, removing an approximate regional field can be of critical importance in isolating an anomaly for further processing as maps or input into an inversion. The following is an example showing the regional magnetic map and a local anomalous field taken from a survey in central British Columbia. The area is Mt. Milligan, which has recently opened up as a mine. In the large-scale map the dominant feature is the magnetic signature of the mountain. Of interest is a (2km x 2km) segment of that map. A large-scale regional field is estimated, subtracted from the observed data, and the results are shown in a second window. The magnetic feature observed in that map is related to the ore body. before removing the regional trend. the regional SW-to-NE trend has been removed. Reduction to pole is a processing step which allows for easier interpretation of magnetic data. 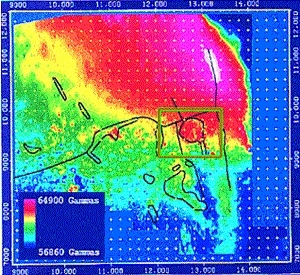 During a reduction to pole, the observed data are used to compute the magnetic anomaly that would have been measured if the Earth’s field had been vertical (90 \(\!\,^o\) inclination). The magnetic anomalies from susceptible bodies depend significantly on the inclination and declination of the Earth’s magnetic field; see Fig. 42. As a result, it may be challenging to resolve the location/orientation of a susceptible body solely by examining the anomaly it produces. In Fig. 42 b, we see that the location of maximum anomaly amplitude is offset from the location of the steel pipe. However, the location of the pipe and the maximum anomaly amplitude are the same when the inclination is 90 \(\!\,^o\); this is the case for most susceptible bodies. For an inclination of 90 \(\!\,^o\), it is also easier to determine if the object is elongated or dipping. Fig. 42 Magnetic anomaly from a vertically orientation 2 m pole for differing inclinations of the Earth’s field: a) 90 \(\!\,^o\), b) 45 \(\!\,^o\) and c) 0 \(\!\,^o\). To demonstrate the effectiveness of reduction to pole, let us consider a magnetic UXO survey (Fig. 43). On the left, we see the total magnetic field data collected at the survey site. Although anomalies indicate the presence of a number of potential targets, the location of each object relative to the anomaly it produces is inconsistent. However after completing a reduction to pole (right), the location of each potential targets becomes easily visible. Fig. 43 Total field magnetic data over UXO before (left) reduction to pole and after (right) reduction to pole. The true location of each object is labeled by a black dot.